Budapest apartment is literally in the heart of Sofia - Bulgaria's capital. In a minute away is the Arena di Serdica, the Council of Ministers, direct subway connection to the airport and railway station. Perfect starting point to explore the city! The Budapest apartment is completely renovated in April 2016. It has 3,5 m high ceilings. Very comfortable for tall people. Bed 146m/2m or extended to 2,20 m. Comfortable working and ladies desks at disposal. All the major things needed for our guests for their stay - bathroom, small living room and a bedroom. 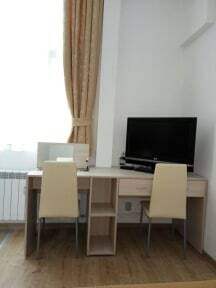 The apartment is suitable for 2 Adults and child on portable bed. There is a cable TV, air condition and fast Wi-Fi. No Kitchen area. In the bedroom there is a king-sized bed, а useful wardrobe and a commode. There is a nice view to a modern building at central street. High speed Wi-Fi and full full package cable TV; Refridgerator; Very comfortable mattress, quality bed linen and towels; Iron and ironing table; Welcome pack - bottle of water, coffee, tea and a bottle of local wine included; Nearby paid parking garage. Kids bed is available upon request at extra charge. Please do not make noise and follow the rules of the building.